The Birdman of Stirling. Henry, Peter and Nicole have arrived at the castle Sterling, with intention to explore the story about the famous alchemist, also known as the Birdman. It is about John Damian who is an Italian alchemist that has promised to the king that he will provide him a lot of gold. As every alchemist, he believed that he will turn a great amount of regular metal into gold but somehow he didn’t manage to do that. The alchemist didn’t want to lose the trust from the king, so he promised the king another thing – he will make actual wings and help people fly. John has worked on this project for a certain period of time and on this historical event were present all citizens of Sterling. However, no matter all the efforts, the experiment resulted without any successes. John was remembered as the Birdman of Sterling and after that this story became a legend, making people wonder if it was an actual truth or just a story that went from generation to generation. Our today’s heroes are writers that would like to write a book about this extraordinary person. They would need some help to find the evidences that will give them enough information about this man and his unusual acts. Let’s help them and learn something more about John Damian. Was he just a charlatan or a real alchemist?! 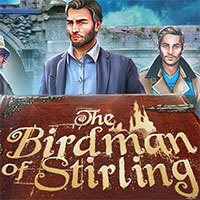 The Birdman of Stirling is a free online hidden object game on Hidden4Fun.